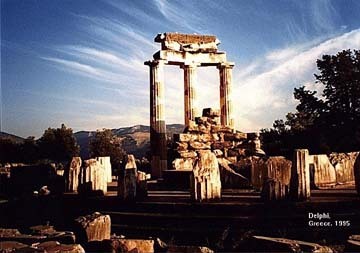 Tholos, Sanctuary of Athena at Delphi, 380-360 BC. Welcome to Old Stones, a website about selected topics in ancient art and archaeology. The material on this site includes original photographs, images, timelines, and links to related art history pages. "The Dancers," tomb fresco from Ruvo, Italy, 350 BC. All pages © Michael D. Gunther. For rights of use, see license.